Rebecca wants me to tell you that Joan Baez made Bob Dylan’s career. She may well even have a point. While it’s true that Dylan received incredible support from the folk acts of the early-1960s (Pete Seeger; Peter, Paul and Mary, many others) who recorded, performed and endorsed his songs and his skills, it was Baez that pushed him to the next level. Baez broke onto the folk scene about three years earlier than Dylan, with her performance at the 1959 Newport Folk Festival. By the time Dylan was playing coffee houses in New York, she was already a successful performer who could be found on television. Dylan writes in Chronicles that he fell in love with her the first time he saw her on television (who wouldn’t have? ), and though the two met at a show in New York very early in his career, it wasn’t until 1963 that they became a couple and performed together frequently on stage. They seem to have met at the Monterey Folk Festival, where they sang a duet, “With God on Our Side”, on May 18, 1963 (nine days before the release of Freewheelin’). For much of May and June, apparently, Dylan lived with Baez at her home in Carmel. 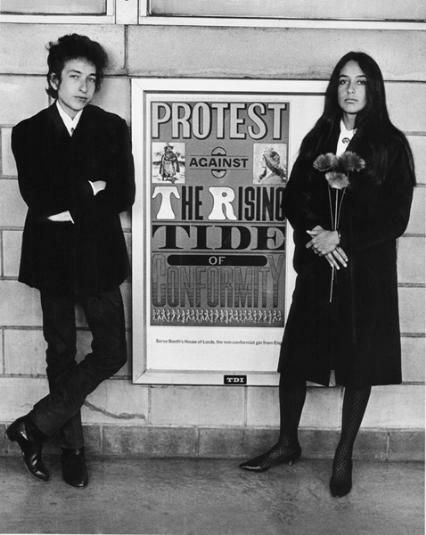 All through August of that year Dylan appeared at Baez’s live concerts as a special guest, performing a half dozen songs, while about half of her set was comprised of things that he had written (Robert Shelton reports that he was actually paid more for his supporting role on her tour than she was – nice to know that outrageous gender pay disparities existed even in the progressive folk scene of the day). Shelton indicates that he wasn’t that well received at the early shows on the tour, but audience reactions grew better over time. Certainly Baez put Dylan over as a star by performing so much of this music on her tour, but more than that, and this is Rebecca’s point, it was her voice that helped him. Baez is one of the very few people who can convincingly duet with Dylan, who has significant limitations as a singer. 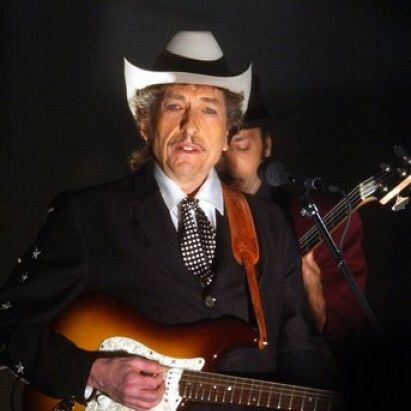 Basically, you need to work around Dylan – there doesn’t seem to be much chance that he is going to harmonize with you. At the March on Washington, for example, she fills in the gaps around his voice. Her contributions to the singing are always more musically nuanced, and the strength and clarity of her voice take the rough edges off his. While there was a strong “hillbilly” tendency in American folk that would allow the scenesters to appreciate solo Dylan, for the vast mainstream of American music fans, folk meant the clear tones of Baez and Seeger, not the regional twang of Dylan. By lending her voice to his, Baez made him more credible as a solo singer for the pop world at a time when he might otherwise have just become a songwriter. I don’t have a great deal of Baez and Dylan singing together from 1963, which is too bad because what I do have is so great. Here’s the one that I think you should listen to, “Troubled and I Don’t Know Why”, from Forest Hills Stadium (August 17, 1963). I had never heard this song before this week. I believe that Dylan wrote it, but am not exactly sure of it. His website seems to indicate it, and it also suggests that this is the only time he played it live. It’s a perfect example of Baez smoothing off Dylan’s rough edges and making him palatable. Plus it’s quite the foot stomper of a song – three chords and power right through. I’m going to learn it on my banjo!